This project was developed in 2011. It is now deprecated, however it may make a comeback. This page only exists for archival purposes, for now. Automatically download the best match from the fastest server. Open source software! Fork it, fix it, tailor it to your own needs! 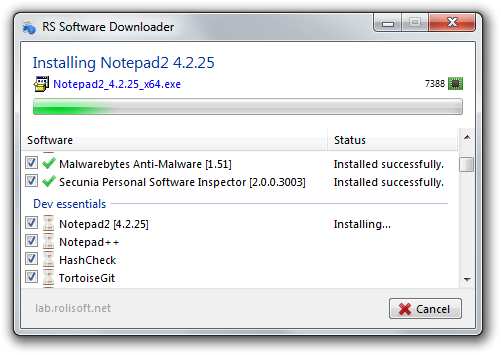 This software was mainly developed because the most boring and time-consuming part of a Windows reinstallation is installing all the software you're going to use. It's not inteded to be a real package manager. Actual package managers work with their own internal database and this gives them both advantages and disadvantages: they can silently install and then keep a software up-to-date, however, they can only work with software listed in their database. Usually the less popular software will have out-dated versions or they won't be in the database at all. 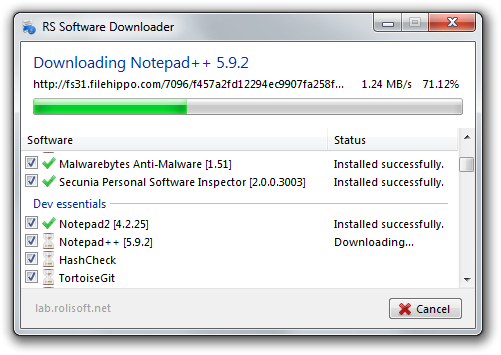 This software can search on most of the major software download sites, list results, download the installer, and then launch it. After the installation finished, the installer will be deleted from the %TEMP% directory. The success of the silent installation will be determined by the installation processes exit code. All major installation systems return 0 when the installation was successful and +1 when the installation was cancelled by the user or failed due to some other reasons. The software has minimal scripting-like features. You can create a new txt file and write a software name on each line. 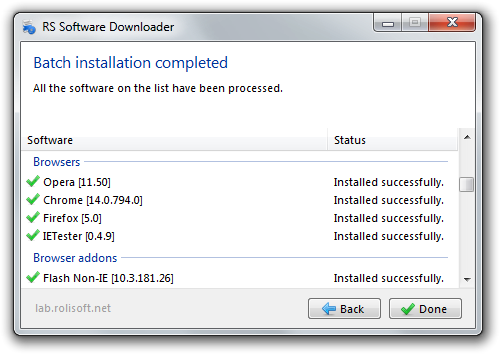 When this file is passed to the software, it will automatically try to install them. The @_short_ operator will specify the software on which site to search for the software. You can specify more than one such operators separating them by a space. The ^_regex_ operator will specify which link to select for download if a site offers multiple files for download (like Softpedia does). This operator's value will be compiled as a regular expression. The regular expression ends at the very first space, so if you want to match spaces in your regular expression, use \s instead. 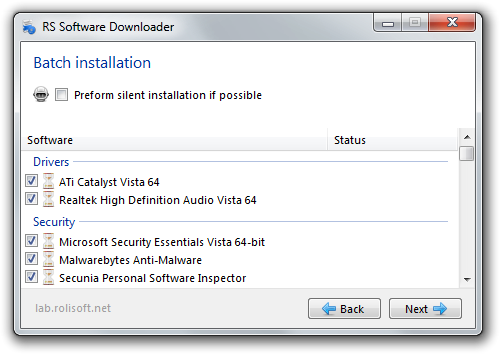 The /s operator will force a software to install silently (if possible) even if silent installation is turned off. The /!s operator will force a software not to install silently even if silent installation is turned on. These files were formatted to be compatible with RS Software Downloader; just download them and drag-and-drop them into the software's start page. If silent installation is turned on, the software will analyse the downloaded executable, determine the installation system and launch the file with the according arguments.